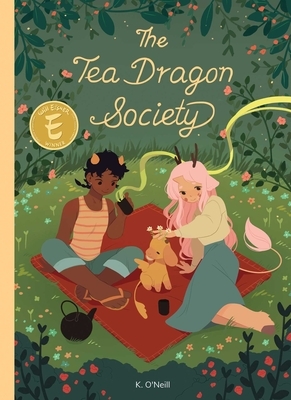 The Tea Dragon Society is the two-time Eisner Award-winning gentle fantasy that follows the story of a blacksmith apprentice, and the people she meets as she becomes entwined in the enchanting world of tea dragons. From the award-winning author of Princess Princess Ever After comes THE TEA DRAGON SOCIETY, the beloved and charming all-ages book that follows the story of Greta, a blacksmith apprentice, and the people she meets as she becomes entwined in the enchanting world of tea dragons. After discovering a lost tea dragon in the marketplace, Greta learns about the dying art form of tea dragon care-taking from the kind tea shop owners, Hesekiel and Erik. As she befriends them and their shy ward, Minette, Greta sees how the craft enriches their lives—and eventually her own. BONUS CONTENT: Included in this gorgeous, oversized hardcover is "Extracts from the Tea Dragons Handbook", explaining more about the creatures with illustrations of all the dragon breeds not seen in the graphic novel. And don't miss Aquicorn Cove, Katie O'Neill's adorable follow-up to The Tea Dragon Society. Katie O'Neill is an illustrator and graphic novelist from New Zealand. She is the author of Princess Princess Ever After and The Tea Dragon Society, both from Oni Press. She mostly makes gentle fantasy stories for younger readers, and is very interested in tea, creatures, things that grow, and the magic of everyday life. "Undeniably whimsical and extremely cute." "A gentle fantasy perfect for introducing young readers to graphic novels." "This book is wonderfully inclusive, and depicts a distinct and expressive cast of LGBTQIA characters and people of color." "The magic of the world is in the forefront as the novel and color palette move from season to season, beginning and ending with spring. Greta's story is soft and sweet, a journey of growing love and friendships." "Old crafts are falling by the wayside in the enchanting fantasy world of O’Neill’s second graphic novel, following Princess Princess Ever After. Part goblin, part human, Greta, a girl with brown skin and squat horns, is learning her mother’s trade of blacksmithing, even though swords aren’t used for much anymore. After rescuing a tiny tea dragon that has gotten lost at the market, Greta starts learning how to care for these creatures, whose horns sprout leaves that are harvested for tea. O’Neill sets her story over four chapters, one for each season, gradually expanding Greta’s world and her understanding of it. Colored in a palette of warm greens, pinks, oranges, and blues, her delicately drawn panels hum with a subtle romantic energy, particularly when Greta learns the backstory between the two remaining members of the Tea Dragon Society, a goatlike creature named Hesekiel and his strapping, wheelchair-using partner, Erik. (There’s also a whiff of burgeoning romance between Greta and Minette, a girl with unreliable memories who is also learning to care for the dragons.) A quiet, charming story of nurturing friendships and traditions."